MAN ALIVE! That action on Monday is enough to make a trader fold up operations and go back to counting beans or selling un-needed crap to folks. That was seriously some hair-raising action. Did you get your stops ran? Did any of you traders get whipsawed by Monday’s action? Rest assured, you probably weren’t alone. If you’re attempting to go short here across any of the indices and had your stops ran on Monday then kudos to you for maintaining discipline. However, you just may be missing out on more of the fun of a potential downmove. Hard to say because my crystal ball is in the shop and for some unforeseen reason I’m not omniscient. It really makes me mad that I can’t call the exact turns of the market. Oh well. I still think a downward short-term bias is in effect and eventually the perceived risk indexes(Russell 2000 & NASDAQ) will finally pull down the “Great Proxy”, the S&P 500. So far, so good for the S&P 500 as it set new highs this week…and has promptly come off those highs. Is that strong price momentum? Have a look at the daily action in the VIX. It gapped down to start the week and within 3 days that gap has filled, but still yet, the VIX is still down around all-time lows. The MACD has been a pretty simple and fair indicator to clue traders in when the volatility is going to start spiking. 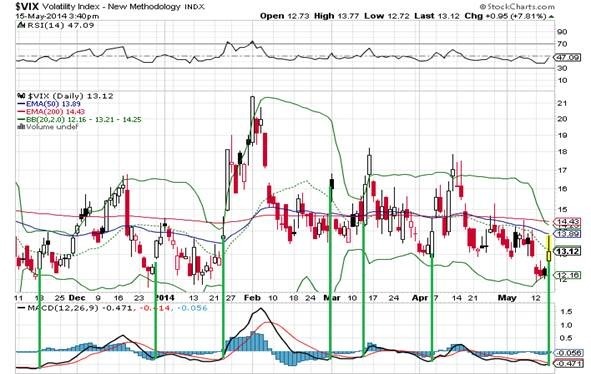 Observe at the green lines that every time the MACD turned upwards, the VIX was usually in the early stage of an up-move. Are we at another up-move right now? It feels like it. 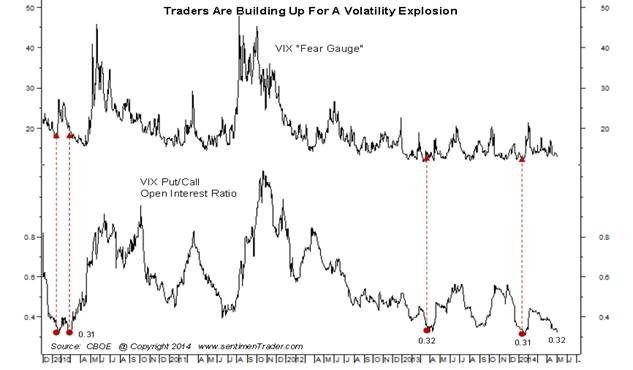 If things get dicey, a quick move up to 20 on the VIX could easily occur. There are plenty of messages being communicated very loudly and clearly by the markets. These aren’t esoteric signals that only the true professionals can divine. Anybody with the ability to read and some dial-up internet internet service can see these messages…more power to you if don’t have to result to a screeching connection via Juno or NetZero or whoever the hell provides dial-up these days. Also, to any readers who currently utilize dial-up to access this blog, please excuse my insensitivity. Things are happening in the markets such as defensive rotation. Utilities have performed fantastically so far the past few months while the rotation to staples vs discretionary appears to have begun. Less and less issues are hitting 52-week highs despite the DOW and S&P 500 sitting near their own highs. Treasury rates continue to drop. Wal-Mart missed fairly big on YoY Q1 income. High-flying tech and small caps have already come off pretty hard and these are where the risk is allocated. Social media sites trading at P/E’s in the multi-hundreds. Biotech stories being sold on a wing and prayer for ridiculous valuations. High-flying tech and small caps are part of what I call the 3-legged risk stool that are sort of propping up the animal spirits of the entire, current stock market. Two of those legs have been kicked out, so to speak, and yet still the S&P 500 hasn’t really shaken out the bulls. 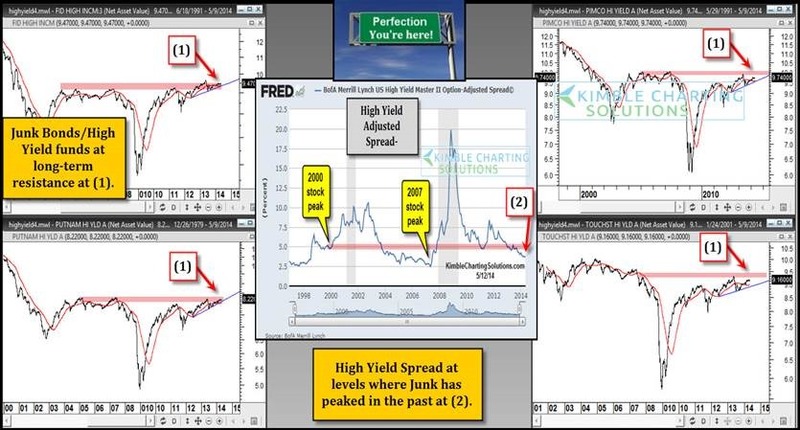 The third leg of the shaky risk stool and thus potentially the ultimate catalyst for a correction in the broader markets is junk bonds, I suspect. So then what could be a catalyst besides stiff resistance? Oh I don’t know. Maybe the humongousest junk bond issuance in financial history. Anybody remember seeing this near the end of April? The markets have a funny tendency to act a little wonky after the largest-ever of anything occurs. The action this week has that sort of a backdraft feeling to it. In case you never saw the movie, a backdraft(as defined by the Collins English Dictionary) is “an explosion that occurs when air reaches a fire that has used up all the available oxygen, often occurring when a door is opened to the room containing the fire.” Buyers potentially get a final pull into risk assets before an explosion outwards for a fast and hard move down after the right catalysts make their presence known. Despite the already well covered move down in the Russell 2000, it appears as if there is plenty of room for a continuation downward. If you’re trading IWM, then keep your stops at an appropriate level. Biotech’s IBB essentially bounced off it’s 38.2% retracement using the week of August 8th, 2011 as your starting point for a quick Fibonacci analysis. A cautious short in IBB with the potential for further selling down to between $200 and $205, may yield a nice return during this summer. In a previous post, I had stated that I thought coffee was setting up for a short but my favorite indicators were not providing a green light just yet. Well those indicators finally gave their green light. If you’re feeling brave you can follow me on a short of JO with approximate targets of $35 and $30, if the selling momentum really gets going. The list of investing icons who are advising caution continues to build. We’ve had mutual fund heroes like Romick of FPA and Yactkman share their thoughts months ago on building cash levels. Klarman, Marks, and Grantham have given the thumbs down. Now we had David Tepper, Mr. Highest Paid 2013 Hedgie, providing his valued insight on these precarious markets. It may not pay to listen to or heed a blogger like myself. That’s for you to decide; but you can’t dispute that it pays to heed what these most esteemed gentlemen have to share. How about the next article focuses on the IPO market in SF and how ridic the housing prices are… grab that crystal ball out of the shop and let me know when I should buy a place! 😉 Thanks for the insights. Been trying to keep up more with the site and enjoying the reading. Hope all is well! Thanks for dropping by for a read. Glad you’re liking the content. Shoot man, the Bay Area real estate game is just off the charts ludicrous right now. It’s like Canada’s never-correcting housing market balled up into a pocket-sized version with a bunch of tech-illionaires sword fighting for the biggest bid. Good luck in that game. I feel fairly confident in my abilities to assess value and nothing in that area says value, so bide your time and enjoy the current situation and eventually your patience should be rewarded. Thanks again for the eyeballs and good luck on your continued path of building the ultimate business network.